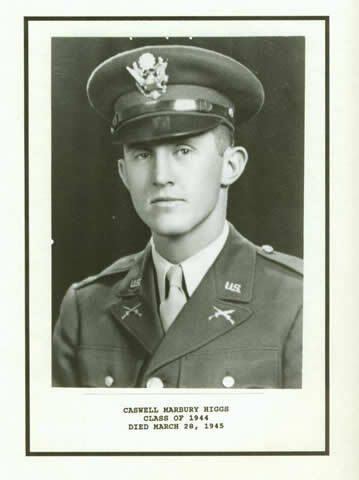 CASWELL MARBURY HIGGS, Class of 1944. “28 March 1945: Enemy resisted our crossing of the RHINE River by placing heavy artillery direct fire weapons, AA, mortar, and small arms fire on our bridge sites, as well as on the city of MAINZ. After our troops were firmly established on east bank of the RHINE, the enemy infiltrated small groups out of the sector. Lt. Higgs was one of three Citadel Men killed in action while serving with the 80th Infantry Division. Captain MAXWELL FARMER PARROTT, Class of 1937, CO of HQ Battery, 633rd AAA AW Battalion, was killed in action on December 4, 1944 at St. Avold, France when the house in which he was billeted was blown up by a time-bomb left by the retreating Germans. Capt. Parrott now rests in peace at Greenlawn Memorial Gardens, Spartanburg, South Carolina. Private First Class WILSON ADELBERT WENDT, Class of 1945, an infantryman with Company E, 2nd Battalion, 317th Infantry Regiment, was killed in action in Germany on April 11, 1945. PFC Wendt now rests in peace at Netherlands American Cemetery. Photo source: 1942 Sphinx, The Annual of the South Carolina Corps of Cadets, Charleston, South Carolina.